When you’ve got hundreds and maybe even thousands of eyes on you or your product, you want to make sure you make an impression. The M222 Quatro Display Truss is the perfect way for companies to exhibit their product and also for bands and artists to perform. Your performance or product is the main attraction, of course, but adding a truss is the cherry on top. The sleek metal framework will give the audience the impression that you are prepared for the exhibition—so prepared that you were even able to think about the audience experience. For encompassing a fairly large amount of space, this box truss is pretty light at only 185 lbs. Stage equipment can be heavy and, furthermore, expensive for large events and concerts, but this truss system does away with those worries. The display is easy to transport and easy to assemble. It also arrives ready to set up and is user friendly. The designers really worked to make the M222 Quatro adaptable to various customers. 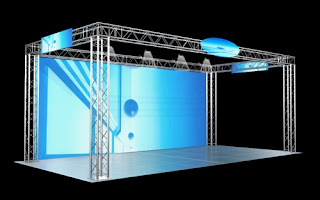 The truss is a 20’ x 10’ design but can be reconfigured to 10’ x 10’ or to fit a goal post without buying any extra parts, making it great for a variety of large and small events. If you want to make the truss a little bigger, you can add a few more straights and increase it to 20’ x 20’. This is probably one of the best features because it reduces the cost of upgrading your equipment if your company or act grows with time. Finally, a great aspect of the Quatro Display Truss is that the manufacturer includes low-cost accessories for various events, such as shelves and brochure holders, lights and monitor mounts. The shelves and brochure holders make this truss perfect for business events and product exhibitions, allowing customers to peruse information about the product in their own time. On the other side, the lights and monitor mounts are perfect for music shows. Some of the best artists nowadays include light shows and play video when they’re performing, and this kit in particular will allow you to create an unforgettable show that will shine in the audience’s memory. The M222 box truss is certain to save you time and money. It’s an investment that grows in value and can be adapted to all your requirements, eliminating your need to buy new equipment. It’ll also give you a put-together look and make you stand out from the others in a crowded room (or a crowded lineup). Make a lasting impression with the Quatro Display Truss by Display Exhibits. Visit DisplayExhibits.com for more great trusses for any event or business.